In my previous post, I had written about the most popular WordPress blogs which are doing amazingly well with thousands of visitors and happy customers every day. They are just the blogs that cover ‘WordPress’ news and tutorials exclusively while there are hundreds of other blogs on WordPress platform that cover different subjects like technology, lifestyle, travel, philosophy, art and more. To name a few from the official WordPress.org showcase, Vogue, thisisFINLAND, The Village Voice are among widely read blogs on the web that are created with WordPress. Want to create the next big blog like these? Or passionate about blogging just as a hobby? If yes, WordPress is the go-to platform for you – the best CMS for blogging with endless blog customization options and the most simple & intuitive interface. Moreover, there are plenty of free and premium WordPress blog themes to start your blog but this post is not about them all. It’s about Cenote! This is to introduce ‘Cenote‘ – a clean and minimal free WordPress blog theme to give your blog a head start. We are happy to introduce ThemeGrill’s next big creation ‘Cenote’ theme! 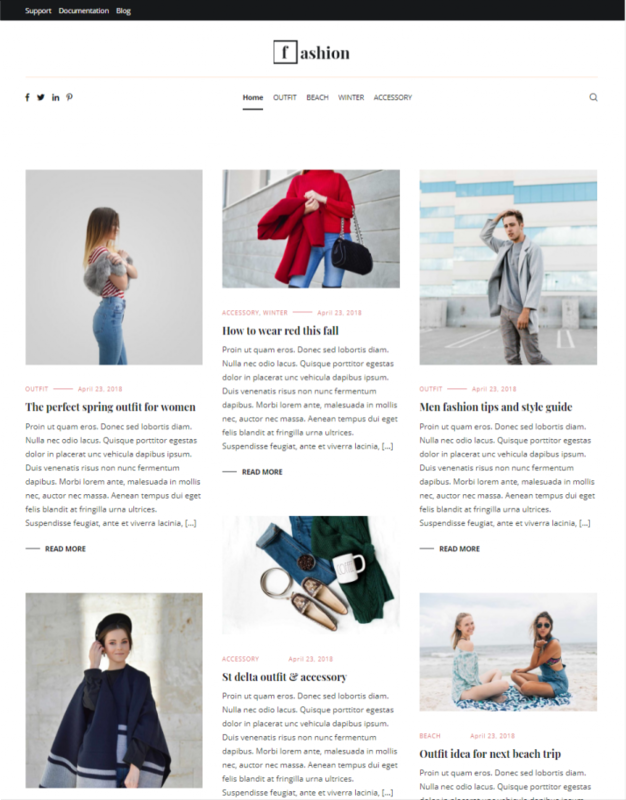 Created with creative and passionate bloggers in mind, Cenote is probably the best free WordPress theme ever. Grilled and molded carefully by the hands of the creative designers and professional coders at ThemeGrill, Cenote is one finest WordPress theme you can ever imagine. 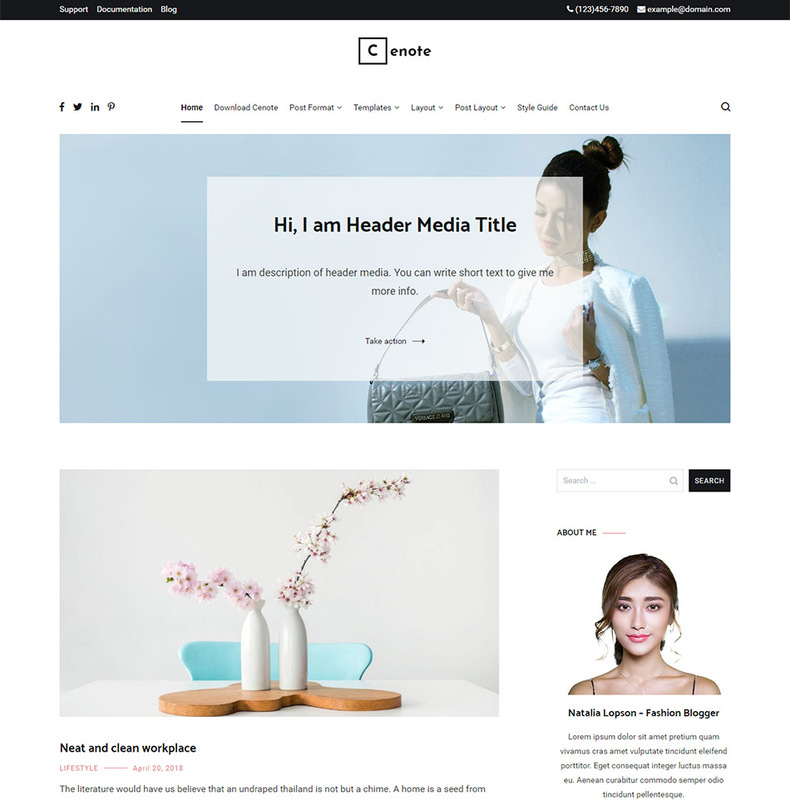 It is a modern, minimalist, and mystically beautiful responsive blogging theme featuring a number of mesmerizing features and functionalities. Before I proceed to discuss the features of the theme, let me quickly tell you the context. Now, let’s quickly discuss installing the theme and demo import, and then the features. Cenote theme is featured on official WordPress.org theme repository so installing the theme is easy and quick. Go to the WordPress dashboard and click on ‘Themes’ under ‘Appearance’ menu. Click on ‘Add New’ and this connects you to WordPress theme repository. Then go the search box, type ‘Cenote’, and then the theme appears. You can simply click on ‘Install’ to install the theme. If you want a detailed tutorial on installing a WordPress theme, here is the complete guide: How to install a WordPress theme? After installation is successful, click on ‘Activate’ and in just some seconds, it’ll be ready for customization. You can simply click on ‘Customize’ to start customizing and the customization panel appears as shown in the image below. Now, you can start customizing each option as shown in the image. You must create pages, and posts to be able to view your site in the making look like the demo which may be a confusing task for beginners. 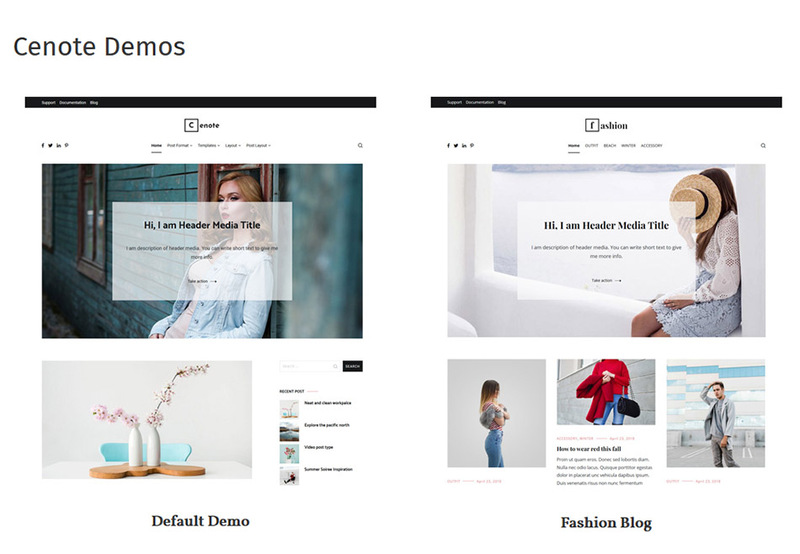 Thus, to ease the website-making process and let the users create an absolutely well-designed blog, the theme offers ‘one-click demo import‘ option. ThemeGrill has a plugin named ‘ThemeGrill Demo Importer‘ which allows single click demo import option with all ThemeGrill’s official themes. So, the plugin comes handy here. Well, installing the plugin is made easy. As the theme is successfully activated, a message appears asking you to install the plugin as shown in the image below. In case the message doesn’t appear, you can simply install the plugin from the WordPress plugin repository. In case you don’t know how to install a plugin, here is a complete tutorial: How to install WordPress plugins? After you install the plugin, go to ‘Appearance’ menu and there you can see a new menu item ‘Demo Importer’ added. Now, you can easily import the available demos from the Demo Importer. In case you are confused importing demos, here is the complete video tutorial. Choose one from the multiple demos available and import demo data for a quick start. After demo site is installed and activated, you can go to Customizer and start replacing the dummy content with your original content. In this way, you can instantly create a website that looks just like the theme demo website. However, there is always a room for creative webmasters to explore the features and functionalities. Let’s discuss the main features of the theme below. 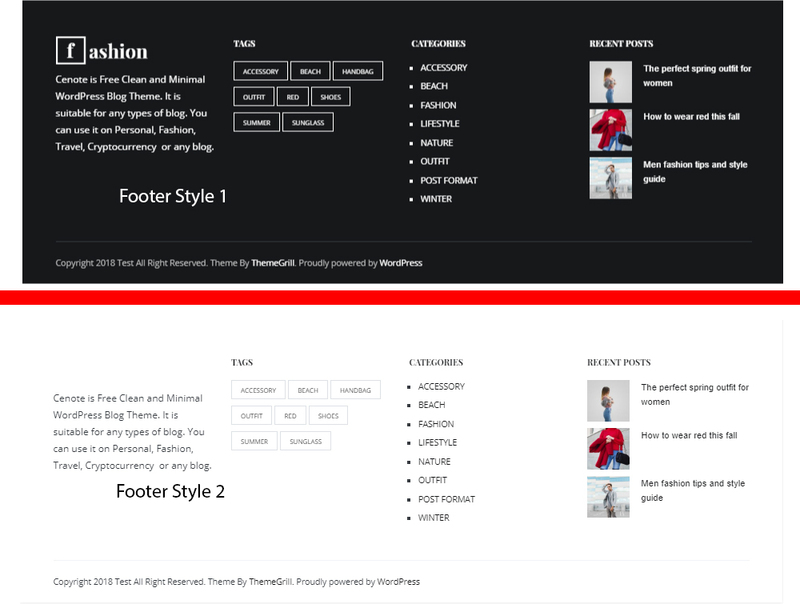 The free version of the theme has two demos ‘Default‘ and ‘Fashion blog‘ now and more will be added soon. Cenote lets you show your posts and blogs in a Masonry layout. A masonry layout lets you show posts, images, blogs and related contents in a grid where the height of the columns aren’t defined. This lets you mix in variously sized content in a grid without having waste spaces. Masonry layout can be quite useful if you intend to make photography blogs, or blogs with a lot of image content. Pinterest is one of the more notable websites with a Masonry layout. Breadcrumbs are basically a graphical control element on web pages to keep track of and maintain awareness of their locations within programs, documents, or websites. With Cenote, you get full support for breadcrumbs that allows the users to insert breadcrumbs all over your website easily. Help your viewers keep track of what webpage they’re viewing and direct around the website easily using Cenote’s amazing in-built breadcrumbs feature. 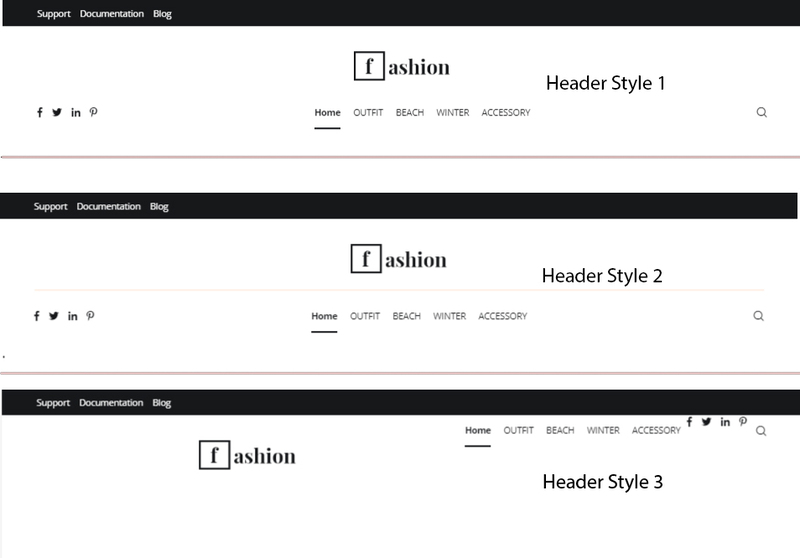 Cenote also comes with three distinct header styles, each with its own attractions. Choose which header style fits your blog better and customize with the various header options provided to you. You can also enable a sticky header on Cenote enabled websites. This feature lets your viewers scroll down while the header still stays at the top of their screen ensuring that your blogs have that distinct feel of professionalism. You can also enable Drop cap for the first letter of your blogs for individual posts as well as blog/archive listings as well. This can be a great option if you want to attract viewers to your posts or start your content with a large bang. Furthermore, the blog customization menu also lets you directly re-arrange the items on your blogs and archives. Simply drag and drop various items such as Title, Meta-tags, Thumbnail, Content etc and re-arrange it to change the look for your homepage for blogs and archives. Cenote also provides you the ability to control layouts individually for posts, ages, blog/home, archives, etc. You can choose between no sidebars, right sider bars and left sidebars and choose different layout separately as well. 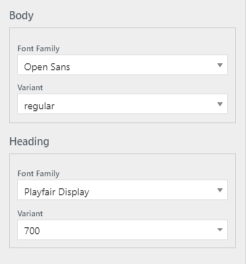 You can also manage typography settings for your blogs through Cenote as well. Choose what fonts and font variant to use for Body content and Headings all over your website through a single option menu. Furthermore, Cenote, being inherently a free WordPress Blog theme comes with various Blog layout and themes to suit various types of blogs. Choose between 3 individual blog/archives style, with the default one being the Masonry layout. Furthermore, you can also choose how many columns your homepage or archives can have as well. The blog-centric features don’t end yet as you are also provided with a custom Author box for your posts. You can simply enable or disable this in your post options for the theme as well. Cenote also comes with two separate Footer styles with inversed color themes. Choose the darker skinned or the lighter skinned custom designed Footer style and customize it accordingly. Cenote also further extends the above feature by also letting you sort content for individual posts and pages as well. Letting you re-arrange the content items and providing the opportunity to create a distinctive appearance for your blogs. You can also enable a Back to Top button for your website. The button is smartly optimized and will display itself when a viewer scrolls down. At the same time the button is very nonintrusive and oozes an air of convenience to your readers. You can also enable Unique related posts on your blogs as well. The theme lets you automatically display other posts with similar tags and categories. This option is also different from Jetpack’s related posts option as it lets you show content in the Footer instead. Our developers built Cenote with accessibility and optimization in mind. The theme only contains secure and optimized content and is extremely small in size as well. In order to prove it, here we have a Pingdom test done to portray how well optimized this theme is. The theme is massively SEO friendly and was designed with SEO features, integration with JetPack, Yoast SEO and other such SEO related plugins in mind. Furthermore, you can customize and change various items on your website to rank better on Google rankings to help you content flourish all over the internet. Last but not the least, all our themes, including Cenote, comes with a link to our dedicated support channel. Simply send a message to us regarding your issues or a leave a post in our forums to have our honest and well-experienced professionals figure out your issue and help you regardless of how small or big your problems are. To read more about this, refer to here. And thus, these are the core features of Cenote. Remember that all of this is free and none of the features are locked behind the paywall. The theme options are also extremely easy to use and Cenote itself is optimized for beginners. Sunita is a WordPress lover, digital marketing, SEO, and blogging enthusiast. She has appeared on ThemeGrill blog, WPAll, and multiple websites. She loves doing research, writing, travel, music and exploring life. She is a passionate learner and dreamer. Follow her on Twitter and Google+. ← A Complete Guide to WordPress Custom Post Type For WordPress Beginners!